Sunday Assembly will be volunteering at the 2019 Belle Isle Spring Clean-up! This event is replacing the Gleaners volunteer opportunity that was scheduled for the previous week. Come join us as we beautify Belle Isle on Saturday, April 27th. We’ll be meeting at The Flynn Pavilion at 8:45AM. 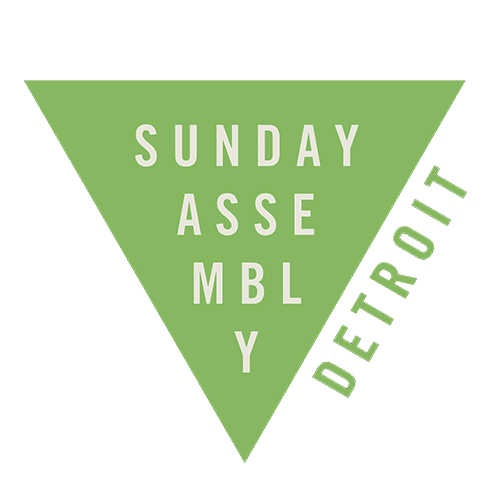 Look for the Sunday Assembly green triangle logo. An accurate count of people attending is necessary, so please make to to remove your RSVP if you cannot attend. This event is suitable for the whole family, so kids of any age can help out. Our group will be assigned a specific area on the island to pick up trash, we don’t have control of this. This may include areas near water/roads, and may include uneven terrain. After the cleanup event ends, everyone is welcome to come over to the Flynn Pavilion at 12:00 pm for free music, food, and celebration! We ask that you bring your own rake and work gloves. If you have other clean-up supplies, please feel free to bring them as well. However, trash bags will be provided. Recreation passport requirement will be waived for Spring Clean-Up volunteers, so there is no need to purchase a pass. Please dress comfortably in clothes that might get dirty, and shoe suitable for walking through wooded areas. Also, make sure to check the weather reports, as this event will be happening regardless of the weather. There will be no area to store personal belongings, so please leave any personal belongings in your vehicle.